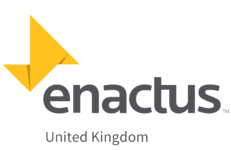 Enactus is an international not-for-profit organisation founded in the USA in 1975. Today, Enactus has more than 69,000 student participants on over 1,700 campuses in 36 countries. Enactus is a community of student, business and academic leaders who are committed to using the power of entrepreneurial action to transform lives and shape a better, more sustainable world. Enactus UK, as a Social Enterprise and a Charity organization, has grown in scale over 15 years and now supports, trains and develops, 3,000 student customers in the delivery of their social projects, while maintaining the engagement of 34 corporate and 57 university partners. We manage the individual engagement between enterprise and education of over 500 volunteers each year. Our UK student-led Enactus teams deliver projects that use innovative and entrepreneurial solutions to tackle a wide range of social needs including: empowering diverse beneficiaries such as the unemployed, homeless, struggling businesses, immigrants and ex-offenders. They also harness the expertise of engineering students to tackle issues such as sanitation, irrigation and disease overseas. These experiences not only transform lives, but also give students the opportunity to step out of the classroom and to develop key skills and the kind of talent and perspective that are essential to leadership in an ever-more complicated and challenging world. To enable progress through entrepreneurial action by creating the framework for our network to develop entrepreneurial focused community outreach projects that have a positive impact in people’s lives, our goal is to enable sustainable human progress. To develop values driven leaders. We believe that entrepreneurship and business can play a critical role in providing solutions to some of the world’s most challenging problems. By connecting generations of leaders to learn from each other and challenging students to apply that learning to solve real world problems within their own communities, they develop stronger leadership skills as well as an understanding that they can have a positive impact on society through entrepreneurial action. Like in business, we believe that competition in the social sector encourages creativity and rewards results. For Enactus, the regional, national and global competition process ultimately means more lives impacted around the world. One National Champion team from each of our 36 operating countries qualifies to participate in the annual Enactus World Cup where they will compete for the title of Enactus World Champion. Every year a group of 3,500 student, academic, business, government and foundation leaders from around the globe meet at the Enactus World Cup to showcase how entrepreneurial action and shared innovation is transforming lives and creating a better future for us all. Our signature global event –this unique gathering provides the opportunity for present and future world leaders to see how ideas are being turned into action as they experience three unforgettable days of collaboration, competition and celebration. An approach to project management, planning and delivery. Giving hope to the female inmates in Nigeria, so that they can find work, feed their families and live a fulfilled life without turning to crime. Working with ex-offenders to give them the building blocks to secure long-term empowerment and ultimately employment. Working in Uganda to give individuals who have a passion for fashion a route into the industry whilst also providing with a stable income.